It's been a flurry of sewing madness here, getting ready for Colonial Williamsburg next week. I've ripped into a lot of garments, and made some pretty big changes to many - necklines needed lowering, waists needed letting out. 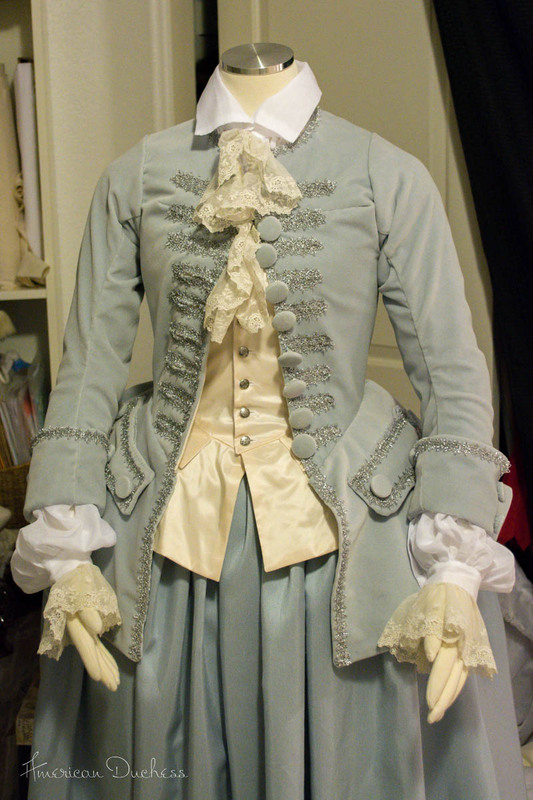 Of the items I made new, two were for one outfit, my 1740s riding habit from several years back. I've actually only worn the habit once, so I'm looking forward to sporting it in CW. However, it no longer buttons closed. This isn't me in the photos, but you can see how the jacket originally fit, fully closed over the stays. I expected that, since nothing else fit, but instead of altering the jacket, I decided to make a waistcoat to go underneath, so the jacket could be worn open. I thought it would be a simple project, but vests are deceptively hard! 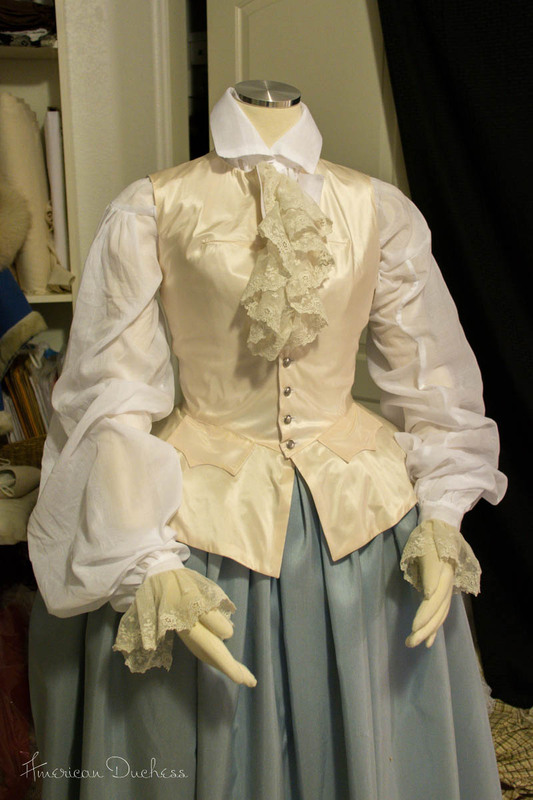 I wasted a bit of taffeta, being overconfident, and had to start over a couple times, but in the end, I won, and also ended up developing a basic historical doublet/jacket bodice pattern in the process. The waistcoat, in ivory taffeta. The back pieces are just cotton, with lacing at the waist. The skirt is on the front only, doesn't extend around the back. "History of Underclothes" - from an article by Reconstructing History - click through to read. Before the Automobile, Diary of a Mantua Maker, and Saltpetre and Pins each shed light on how this shirt was constructed and worn. It's like a combination shirt + chemisette, and is worn over the stays. The habit shirt - short and gathered in back on a twill tape drawstring, which then ties in front. Buttons at the neck and wrists. 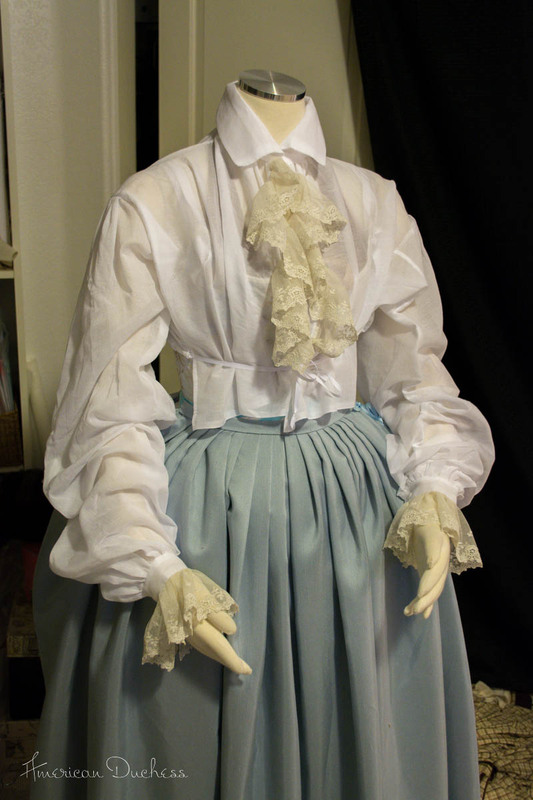 I used cotton voile (I like my shirts as light as possible), with antique lace at the cuffs and neck ruffle. I make my sleeves a bit too long, I see now, but overall the shirt works splendidly. The last detail will be the black silk cravat tied at the neckline. The three layers together - I think it looks wonderfully complex and interesting worn this way. I absolutely love it! So now that's at least ONE fully complete outfit for Williamsburg! I love this costume makeover! It looks quite fabulous! Oooh! I think I like that better than the original version! Fabulous save. I think I like this even better now! oh what a wonderful idea. it looks beautiful. It looks beautiful. You can do it. Spectacular! I love the overall effect. Wonderful solution to the fitting problem! I really love it this way. Your waistcoat and shirt look great. I look forward to seeing picture of it on you! Fabulous!! The whole outfit looks wonderful! It would make me feel better if your costumes were ugly and awful. Unfortunately, they're gorgeous and make me uncomfortably jealous! I love your costumes... every time! I wish I could make a fully female costume sooner or later! Love the original and the makeover. What pattern did you use/modify? Another question - what type of stays did you wear with the riding habit? Full or half boned? A lady on horseback would be wearing riding stays (more flexible than regular stays) and a bum roll rather than hoops or panniers. The paintings depicting the super wide riding habits are confusing because the story implies that the ladies are riding in those dresses, but I think it really is more of an allegory, or just a statement of fashion and wealth. There are some extant 18th c. women's riding clothes that are not designed to be worn over panniers. There are also extant 18th c. women's *traveling* clothes that are, and they, of course, look very much like riding habits. We have to distinguish between on-and-off-horse outfits, which can be very difficult.